Welcome to the Arlene Blum Quarterly Newsletter. Please join me to celebrate the new edition of “Annapurna: A Woman’s Place” on October 23 in Berkeley and enjoy original live music about our expedition, a delicious Annapurna cake, my favorite stories and images from the climb. More information below. This summer, I had a fun holiday on a coral island 36 miles off the coast of Belize and in the Andes of Columbia. There I learned about Fundación Oriéntame, a Colombian NGO, which provides family planning and safe abortion services in 600 clinical practices in ten countries in Latin America and is reshaping the family planning landscape across the region. A great article about them is here, and donations to their work can be made here by choosing the Jorge Villarreal Fund. For me, reducing the use of harmful chemicals and controlling population growth are both critical parts of the ascent to a better world for us all. I am delighted to support Oriéntame and suggest you might consider doing so also. I’m also just back from a series of well-received talks on the Six Classes at the Guardian Green Chemistry Conference in New York, at Harvard, the EPA, and Google in Boston, and the Living Product Expo in Pittsburgh. Our new goal at the Institute is to reduce the use of some or all of the Six Classes containing chemicals of concern in consumer products by 50% in the next five years years. This will greatly benefit the health of our population and planet. You can view above a ten-minute-long introduction to the Six Classes. I shared this with about 400 designers at the International Interior Design Association Breakfast, where I was honored to receive their annual Leadership Award for helping change policies so flame retardants are no longer needed in furniture and baby products. Based on this change, Caroline, our Director of Development, was finally able to buy a couch without flame retardants, and you can too. Her story is below. After replacing furniture or foam containing flame retardants with new foam or furniture without them, levels of these chemicals in your home should go down. See below if you might want to participate in studies to learn how flame retardant levels decrease in your own house dust and your body after swapping out your flame retarded furniture. I hope you enjoy this Arlene Blum Quarterly Newsletter which contains highlights from the last three Green Science Policy Institute monthly newsletters. You can sign up here if you would also like to receive our monthly newsletters on reducing toxics to protect health. 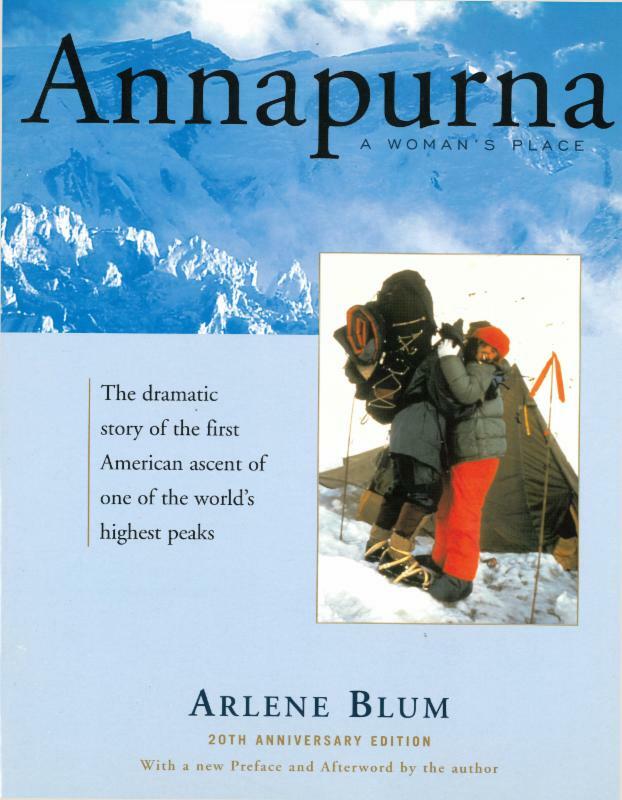 First published in 1980 by Sierra Club Books, Annapurna tells the story of our all women’s team making the first American ascent of one of the most dangerous and difficult of the world’s high mountains. Annapurna was included in Fortunemagazine’s list of The 75 Smartest Business Books We Know and chosen by National Geographic Adventure Magazine as one of the 100 top adventure books of all time. This edition contains a new introduction by the noted climber and base jumper Steph Davis. Autographed copies of Annapurna are available here, or you can buy the book at your local bookstore or on Amazon. Fluorinated Chemicals Found in Babies: Why? The excellent short video from Greenpeace to the right shows that sadly highly fluorinated chemicals are now found in the most remote and seemingly unspoiled places. Since many fluorinated chemicals stay in our bodies for years, it is difficult for expectant mothers to avoid transferring the chemicals to their babies. The best solution is reducing the unnecessary uses of such chemicals in products, which will decrease everyone’s exposure. This is one objective of our www.SixClasses.org project. Check out our Consumers’ Guide to Highly Fluorinated Chemicals for hints on reducing your exposure. 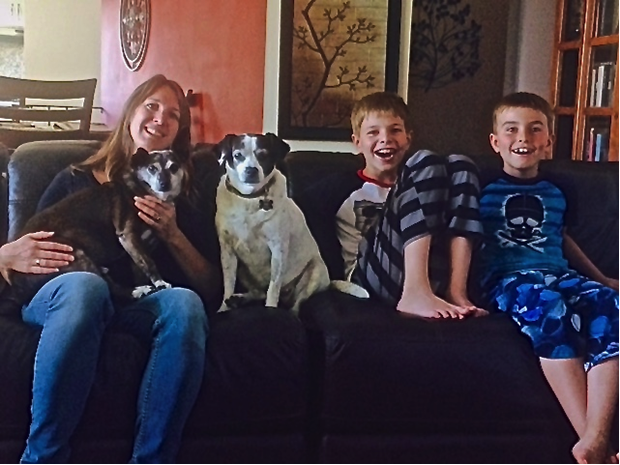 Happiness is a new couch…without flame retardants! In 2012, when I started working at the Green Science Policy Institute, I learned that our decrepit couches contained flame retardants that could contribute to health problems and didn’t provide a fire safety benefit. I wanted to replace these old couches right away, but had to wait for the new TB117-2013 standard. How long did I have to wait? 3 years! 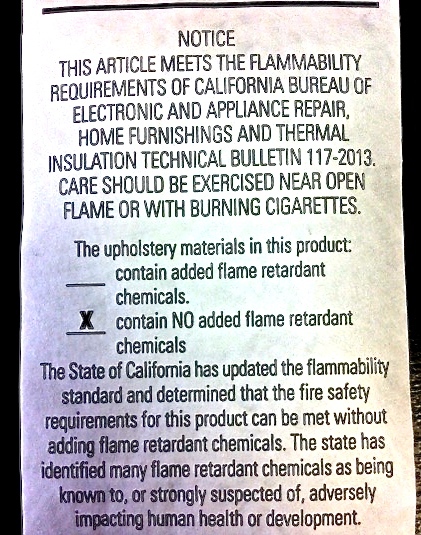 When my husband and I recently bought a new couch, I wanted to be sure it wouldn’t contain any flame retardants. Here’s a copy of the couch label stating “contains no added flame retardant chemicals.” Yay! Now we have a new couch and everyone is happy – apart from the dogs, who are not supposed to jump up (but still do). And in case you missed it, here’s an editorial called My New Sofa from ES&T about our work leading to the editor’s new couch and the value of scientists sharing their research results with decision makers. Do you live in Northern California? Are you planning to buy a new couch or swap out your old foam cushions for new, flame retardant-free furnishings within the coming months? If so, you may be eligible to participate in studies of how the flame retardant levels in your dust and your body change after you reduce the flame retardants in your furniture. In collaboration with UC Davis, Silent Spring Institute, and Environmental Working Group, our study will measure the change in dust levels of flame retardants after removing products containing flame retardants. For more information, call (855) 729-4430 or email CouchFoamStudy@gmail.com. 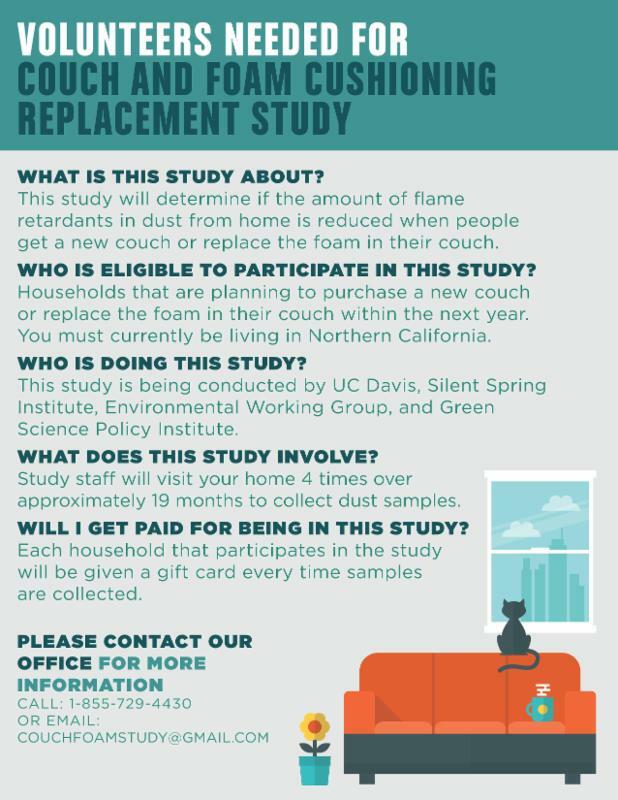 Study participants may be able to join a related study conducted by Biomonitoring California to measure the change in flame retardant levels in their blood and urine after they swap out their foam and/or furniture. This should provide information on how long flame retardants remain in our bodies. October 23, 2015: Book launch party for 20th anniversary edition of Arlene Blum’s “Annapurna: A Woman’s Place” at 7:00pm, at Books, Inc., 1491 Shattuck Avenue in Berkeley, CA. Greg Dalton will discuss flame retardants in furniture with Arlene Blum, State Senator Mark Leno, and Toxic Hot Seat Director James Redford at 6:30pm. This program will be recorded before a live audience. Click here to purchase tickets. Arlene will give a talk for the Women in Science and Engineering Inspirations Network at Stanford from 4:30-6:30pm. Contact cbmuller@stanford.edu to attend. November 13, 2015: A scientific conference in Washington D.C. for developing technologies for the safe disposal of foam and plastic mixed with flame retardants. Contact info@GreenSciencePolicy.org for more information. From the depths of the ocean to the highest mountain summits, our planet is under assault as never before. Arlene Blum and Liz Cunningham share their books and inspiration.